I happily delivered a modern memory quilt commissioned as a Christmas gift. 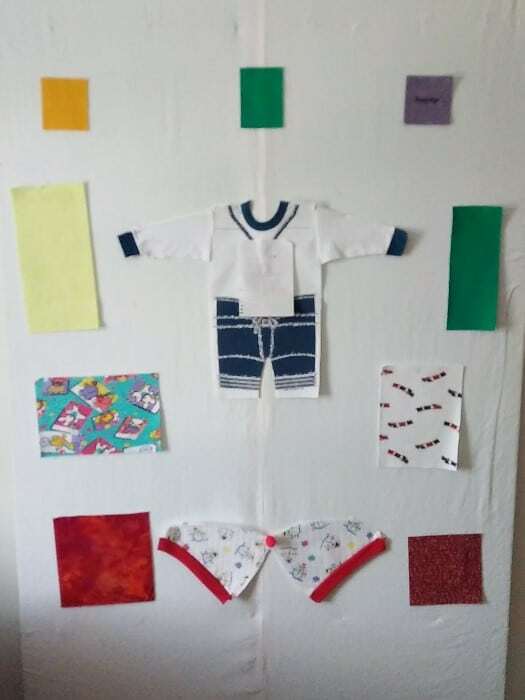 Mom had carefully stored a selection of baby clothes that she wanted me to incorporate into a lap sized quilt for her daughter. I separated the baby clothing into pastels and bright colours. 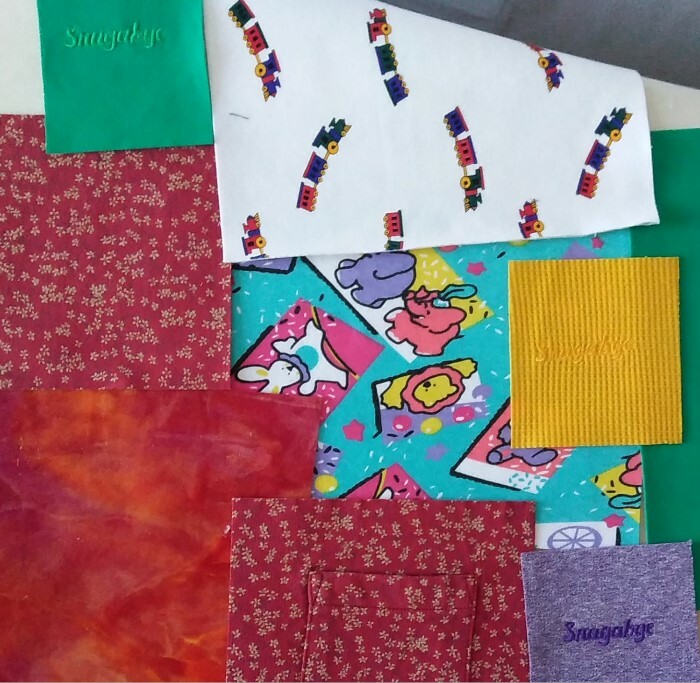 It became obvious seeing the clothing that the quilt was going to be double sided. 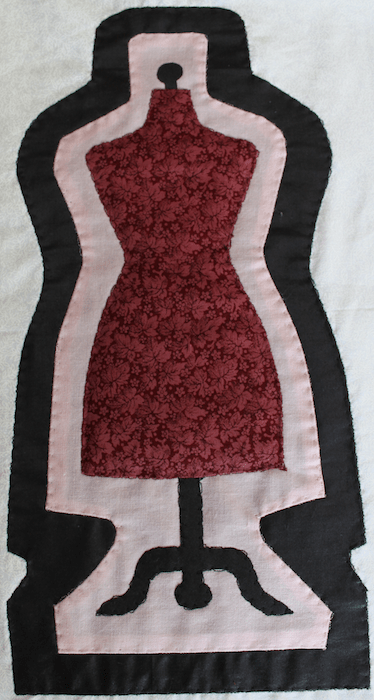 I cut the largest size squares or rectangle possible out of the clothing. 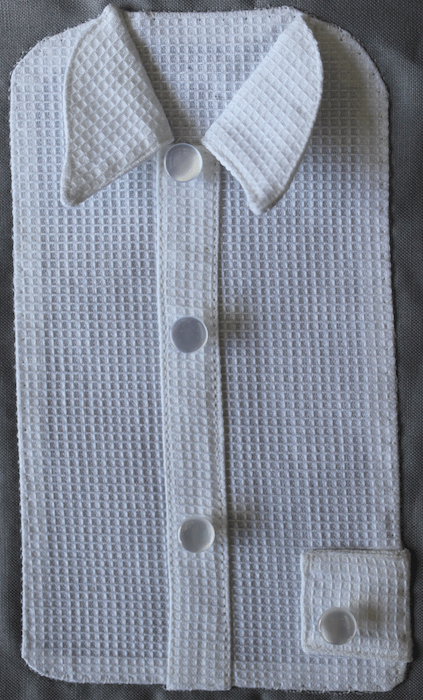 Since most of the clothing was made out of stretchy knits, each piece was interfaced to stabilize it. 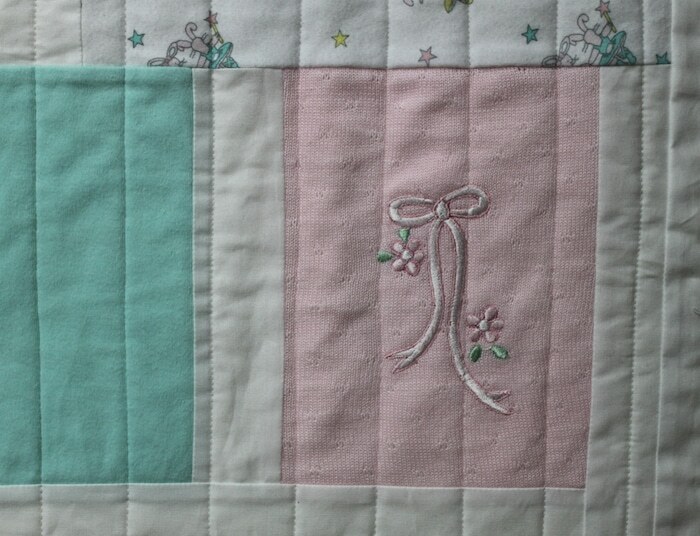 Pastel side of the quilt with embroidered collar, yoke and appliques, carefully cut out and positioned. Bright side with a note to myself pinned to the onesie, not to iron on top of it! 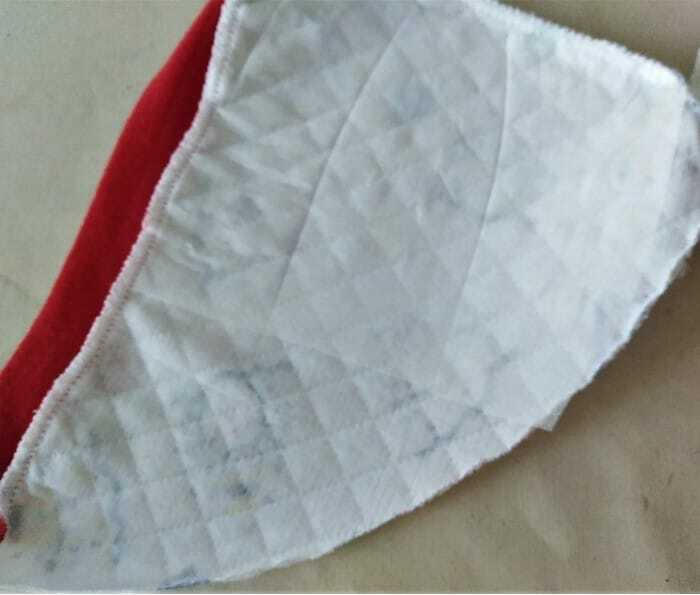 A flannelette baby blanket was put aside to make the binding. 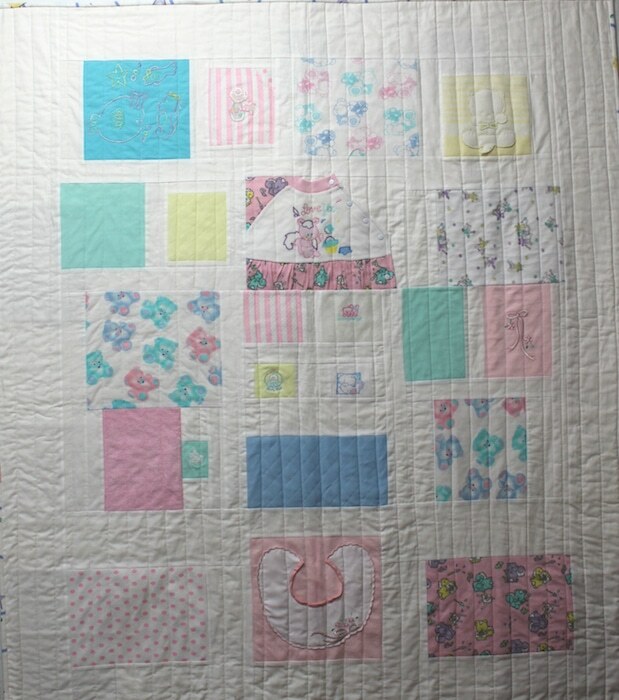 Mom’s side of the quilt featuring pinks and pastels. 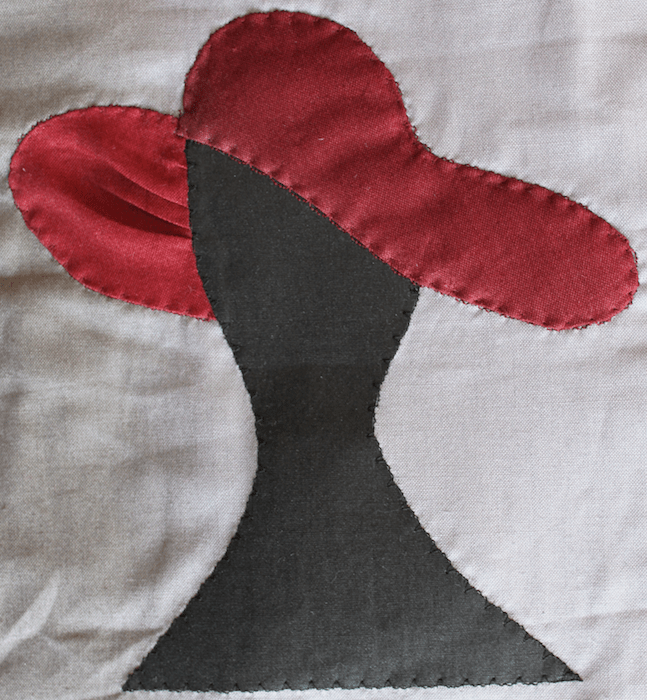 Detail of a beautiful embroidery. 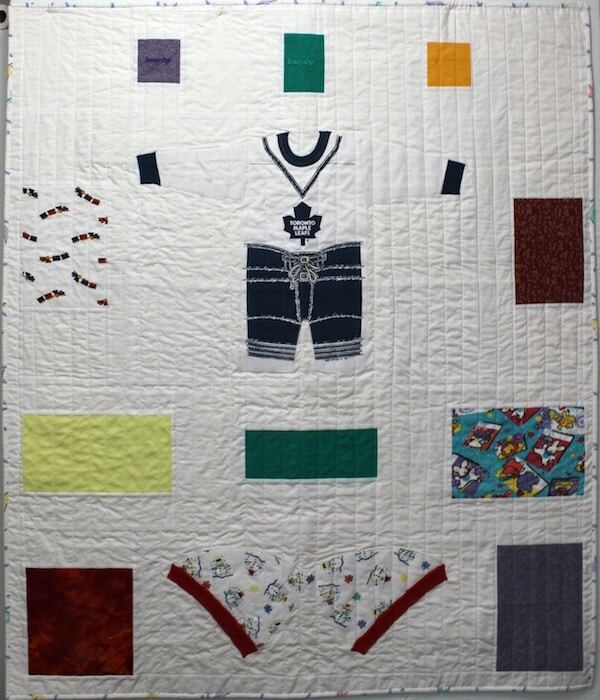 Dad’s side of the quilt featuring a Toronto Maple Leaf onesie, christmas hat and brights. 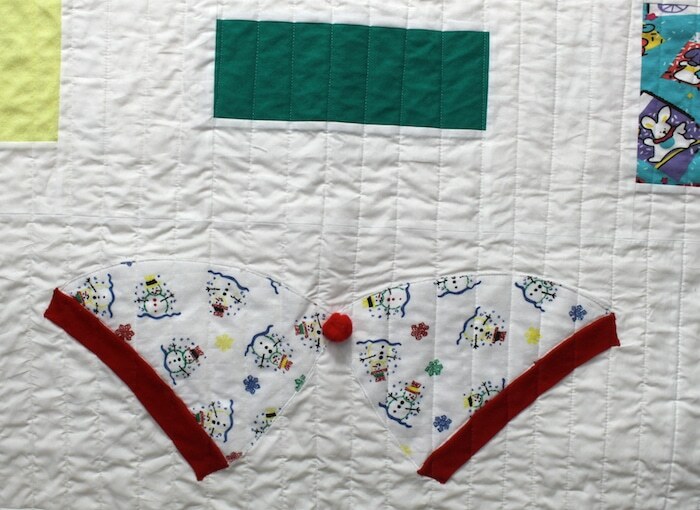 The idea for this quilt really came together after hearing the story behind the very diverse selection of baby clothes. When the baby was brought home from the hospital, they realized that most of the clothing was too large. So, the new mom asked the dad to go out shopping for some smaller sizes. You can see from clearly which ones were purchased by the dad! 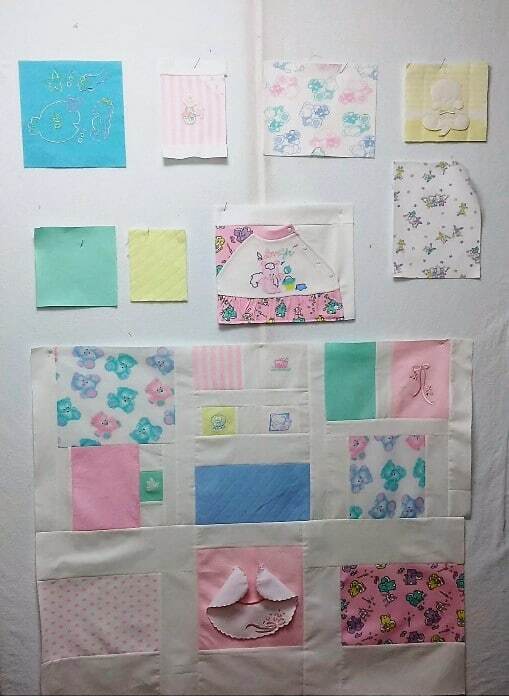 I am happy to have been able to make this memory quilt. I’ve completed the commission for the wallhanging that will be given as a birthday gift. 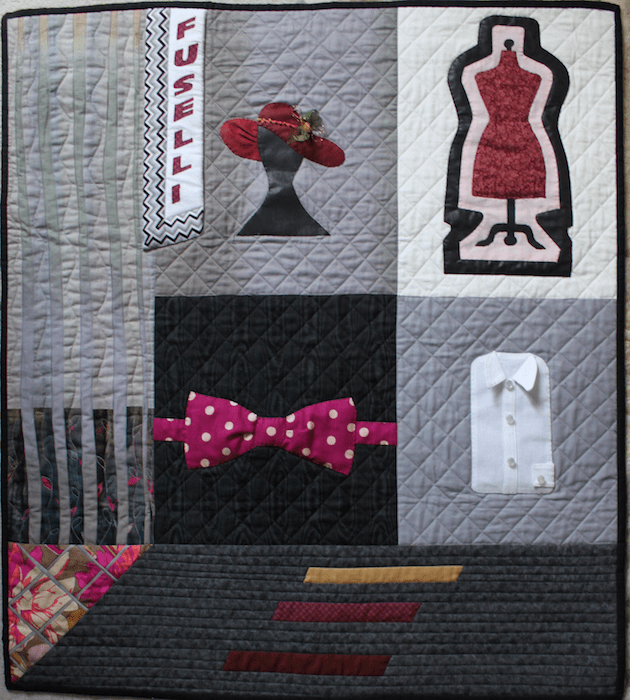 I was asked to create a quilt that references fashion. The shop carries men and women’s fashions and is located in an old stone building. 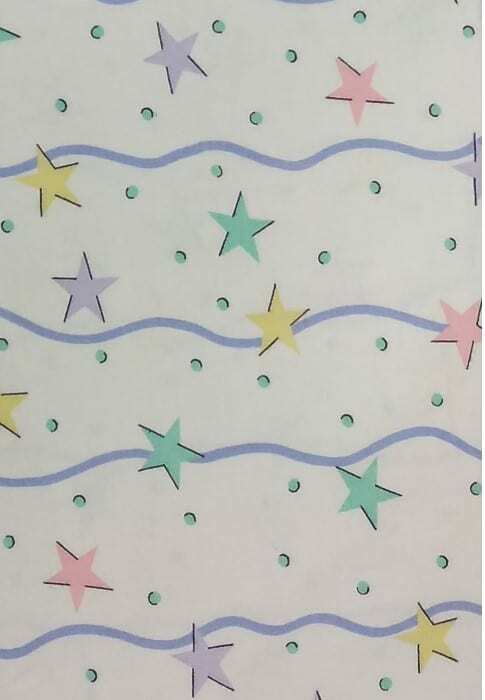 I actually had the outer border designed and created before the central four blocks. I like the way the 2 shades of grey fabric curve up suggesting a wall. 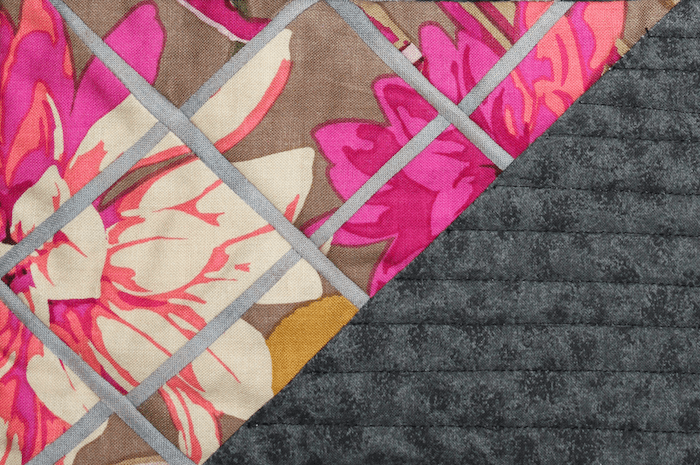 The large floral (Kaffe Fassete fabric I think) seemed to be too obvious, so I cut it on the diagonal and insert very thin strips of grey so that it looks like the flowers are behind a fence. The hat has been decorated and is worthy of a royal tea party. I used a variety of hand dyed silk ribbon from Nell’s Emboidery. A ribbon flower completes the look. I hope the recipient enjoys her gift. I am working on a commission for a birthday gift. The wallhanging is for a friend whose family own a clothing shop. Here is a glimpse of a couple of the blocks. The hat hasn’t been trimmed yet. 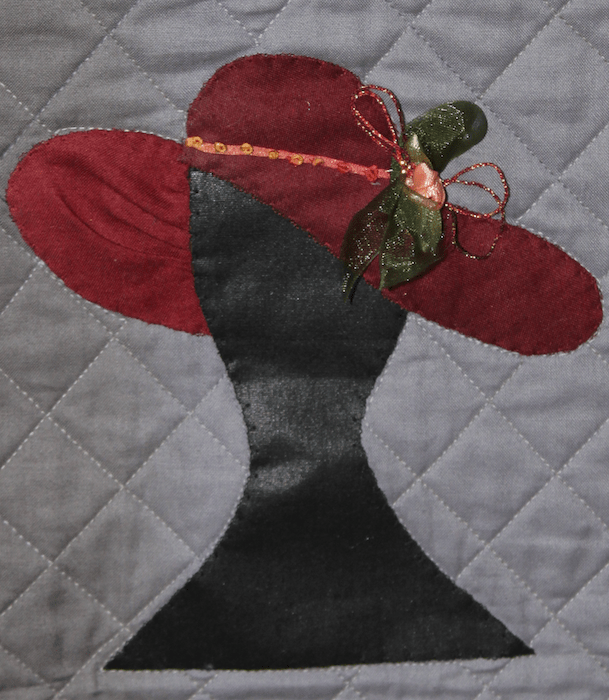 I will be adding flowers, ribbons and beads to finish this lovely chapeau!